Rastamouse has a positive message for young children, promoting the need to understand what is right from what is wrong, and why, in a meaningful context. The stories focus on finding creative and positive solutions to problems and situations. Through understanding and love, Rastamouse always promotes redemption rather than retribution – he’ll always make a bad thing good. With a unique, positive, fresh, fun and ultimately very cool multi-cultural cast Rastamouse is an important brand offering an opportunity to portray, learn about, respect and celebrate the beauty and diversity of cultures around us. 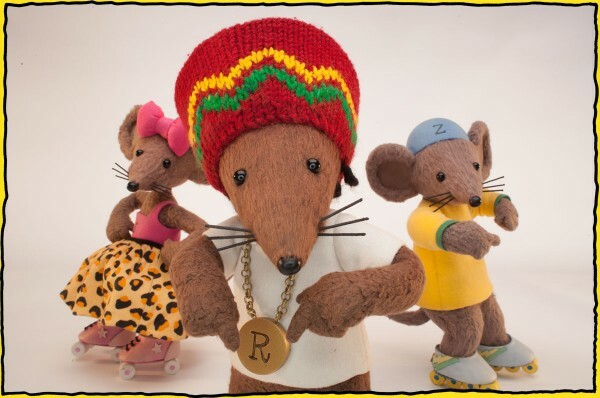 To complement Rastamouse’s rhythmic language, the show’s strong musical component, performed and enjoyed by the cast of funky cool characters, encourages children to join in with the wicked vibes. Rastamouse is a colourful and vibrant brand exhibiting exciting and active characters, who are always on the move, playing music, skateboarding or dancing whilst solving their mysteries. Since his first appearance, in Da Crucial Plan, Rastamouse has always had a life beyond the printed page and beyond the television screen. His use in the classroom, library and the workshop environment provides a clear strategy for the development of the brand into the multi-media domain. Appealing to boys and girls alike; the world of Rastamouse is without question a world of fun, cleverly disguising the fact that there are things to learn about the rhythm of vocabulary, storytelling, music-making and most importantly about life. Our work with children of all ages has proven that the themes, the rhythm & rhyme and the adventures of ‘Da Easy Crew’ encourages young minds to enjoy reading, emulate the detail of the tales and to tell their own stories; inspiring creativity, positivity and participation from individuals who might previously have shied from artistic expression.